Home / Community / Interviews / VNN Interview with BIGHEAD! VNN’s German division was able to attend Dokomi this year. 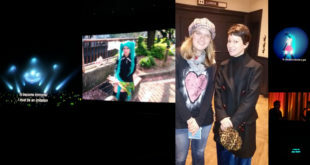 Luckily, we were also able to interview BIGHEAD who attended Dokomi, with TANAKA who wrote the lyrics for their well known song “Sharing the World“, for the Miku Expo 2014! Unfortunately, during the convention, the Dokomi interpreter didn’t have much time, so we were only able to ask a few questions. Due to time issues, part of the interview was conducted in person while the other was by email. However, please enjoy our full interview with BIGHEAD! Note: The interview was conducted in Japanese. While we try to keep our translations as accurate as possible, not everything translates perfectly. VNN: First, thank you BIGHEAD for your time. It’s really nice to welcome you here in Germany! So how was Germany and Dokomi? Would you like to come to Europe again? BIGHEAD: At Dokomi, everything was perfect. Everyone there was enjoying the event with a fresh feeling. It made me feel that animation, manga and cosplay are advancing their own evolution rather than following Japan. Unlike Paris and Nice, which I visited last year, the deep clouds and the beautiful cityscape here have given me some inspiration. I think that I’ll also be able to create new songs influenced by my experiences in Germany. I’d like to come back to Europe soon. VNN: That’s nice to hear! So I guess we could start with our actual interview if you don’t mind. So how did you discover VOCALOID at first? BIGHEAD: I’ve seen this Google ad, the “Tell Your World” video and was very moved by it. VNN: It’s well known today, isn’t it? 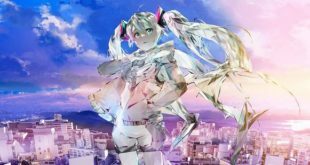 Did you have any experience in writing music prior to VOCALOID? BIGHEAD: I’ve been playing in a band since my days in school, high school, that is, and recorded stuff in a recording studio later on. VNN: Which instrument did you play? Do you still play it? BIGHEAD: At the start, I played the guitar, then the bass, and in my college days, I was playing the drums all the time. When making songs with Hatsune Miku, I still record the bass and guitar by myself, and my drumming experience is useful when programming drums. My past involvement with music is certainly helping. VNN: Only after being in VOCALOID and producing for some time, did you change your producer name to BIGHEAD. Where does this alias come from and what does it mean? BIGHEAD: The person I love has a rather big head – and that’s where “BIGHEAD” came from. VNN: Haha, that’s a lovely choice! So, what we were also wondering, unlike other Japanese producers, you write a lot of English songs. What inspired you to write mainly songs with English lyrics? BIGHEAD: There was a “Western Music Boom” during the time I was in high school. I’ve listened to nothing but Western Music, so I wanted to make stuff like that. I thought that it would be good and common. VNN: And you are indeed appreciated in the west for your work! A lot of Spanish-speaking people love the Spanish version of “Sharing the World”. What do you think about it, and about how other songs are translated into different languages? BIGHEAD: I’m honored that “Sharing The World” is played in various countries, but it is surprising that it has been covered in Spanish, Chinese, and even more languages! I receive a lot of emails every month saying “Please release this” from Mexican fans. I hope that “Sharing The World” will continue to expand all over the world. VNN: You’ve used Miku’s English V3 and her English V4. Which do you think is better, V3 or V4? BIGHEAD: For Japanese, V2 is Number 1. After that, I use V4 frequently. With V4, I think that the possibilities of expression and choices are expanded. As for English, I like V3 in the part of pronunciation and rhythm, so I mainly use v3. I was planning to say that at the Dokomi workshop, that it is effective to use V3 and V4 in combination for harmony parts. I wanted to tell everyone more, but, in the workshop, there were a lot of enthusiastic questions and it was so exciting I couldn’t fit everything in. 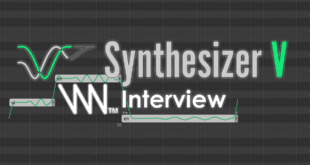 VNN: Are you planning on using other VOCALOIDs in the future? BIGHEAD: I’ve met Joffrey from this French company here at Dokomi, so I decided to make something, and he and I can work on it together. VNN: What do you think about the VOCALOID characters and their personalities? Is it the composer who makes their personality? And for the composer, who is part of the fandom, will public opinion of the fandom form the composer’s opinion on a character? BIGHEAD: I do not think that VOCALOIDs themselves have personalities. VOCALOIDs are colorless and transparent, so composers and listeners can self-project. But the composer cannot make the personality of a VOCALOID, because the personality of VOCALOID is by everyone. I like how that part is hard and can not be handled. However, it isn’t difficult to share VOCALOID content. By using VOCALOID, “Sharing The World” becomes easy! VNN: How was it to cooperate with other artists when making “OISHII” TRIP? 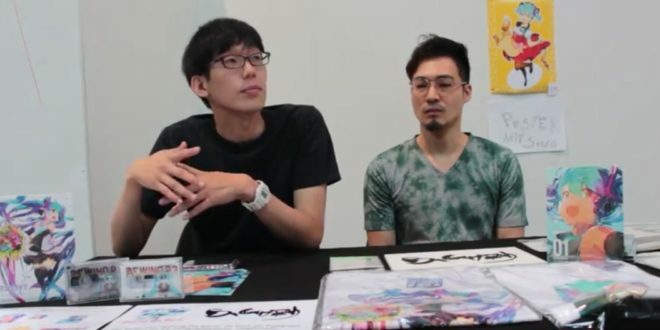 BIGHEAD: Composer Oguro and lyricist Aoyama have profound knowledge about VOCALOID, so we were able to produce smoothly. I have enjoyed it thanks to the experience collaborating with EmpathP, CircusP and ROBO for the first time. Also, this time I was very happy that customers shook hands and raised their voices when playing “OISHII” TRIP at Dokomi’s DJ event. VNN: Do you have any advice for fans who are getting started in producing and are becoming successful? BIGHEAD: After about a year after I started making VOCALOID songs, my first song was selected for a Lady Gaga concert. You never know what can happen, so if you happen to come across a huge chance like that, have the courage to meet the challenge. VNN: Is there anything else you would like to say to your fans? BIGHEAD: I like to take part in events like Dokomi and want to communicate with people from all over the world, so I’d like to thank all the people I’ve met in this country. VNN: Thank you for your time! Hopefully we’ll see you again soon in Europe and have fun at Anime Next! Previous VNN’s “Hatsune Miku x Osamu Tezuka Exhibit” Report! Next Yuezheng Ling is Now Available in Zyon And Much More!